Oman is seen as something of an anomaly in the Arab world, rarely featuring in Western media, mainly thanks to the fact that civil unrest has been unknown for several decades. Governed by the highly revered and adored Sultan Qaboos bin Said since 1970, the country has rapidly developed its infrastructure and enhanced the quality of life for its people, through committed investment in the country from oil revenues. 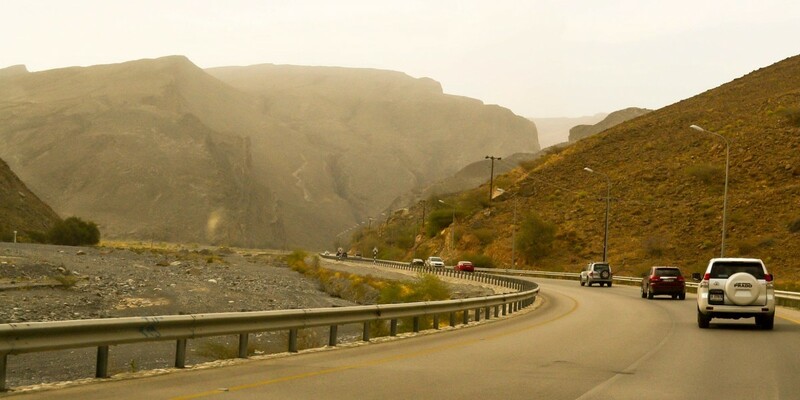 Before the Sultan’s ruling, Oman only had around six miles of well surfaced roads. Today the figure is stretches to nearer 18,000 miles, and roads are mostly packed with 4x4’s. The rocky Hajar Mountains that rise up behind the city leave only a narrow strip for building and development. This unique geography, a low-density population, plus heavily subsidised gasoline, have all contributed to boosting car ownership and cars are perceived to be a most popular and convenient way to get around. This doesn’t come without its problems. Oman’s population is booming, with almost a quarter of the population residing in the capital Muscat alone. Parking is a perennial problem, and the country has the inauspicious status of ranking in the top ten for traffic fatalities in the world. The environmental impact of car ownership is also of growing concern. However, the alternatives to car travel are currently thin on the ground. Public transport is virtually non-existent in this car loving country. For those without a driving licence, and those who lack access or means to use a car, travel options are extremely limited. Those with adequate disposable income use taxi services, which also involve a fair degree of haggling before a price is agreed. For those who cannot take a taxi an informal system of minibuses is available. However, these tend to be open to ‘men only’. To solve these problems, the government is looking at growing investment in the development of viable public transport in Muscat. The Government has long-term plans to develop an integrated rail and sea-transport system and more recently a bus system was implemented. The buses also often have seats that are specifically designated for women, which is seen as a positive by those who use them. Although gender segregation is not as apparent in Oman as it is in Saudi Arabia, Omani women in general are not generally at ease mixing with men who are not known, trusted relatives. This means that the bus system doesn’t just offer a new , good value alternative to getting around. It is also aligned with the needs of women travellers when it comes to meeting their needs for personal safety and space. Many residents declare themselves keen to travel around Muscat using decent public transport. Some do question the extent to which the government is fully aware and committed to delivering a complete public transport system in the near future, but at least the country is on the right track. We are a brand market research business and we've been speaking with people around the world for over 20 years.